The Czech Republic is one of the most incredible countries to visit in Central Europe full of plenty of destinations outside one of Europe’s most popular visited destinations, Prague. Whether you’re planning a trip to Prague or traveling around the entire country you will want to be prepared. 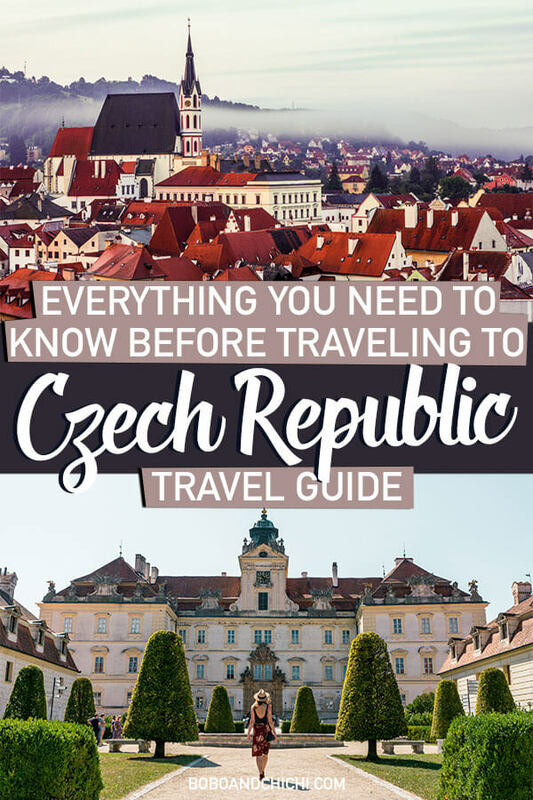 We have put together the ultimate Czech Republic travel guide to help you plan your trip from where to visit, how to travel around the Czech Republic, how to exchange money in the Czech Republic, to accommodation and other Czech Republic travel tips. We must urge you not to make the mistake of coming and only seeing Prague. Prague is overwhelmed with tourism and there in an entire country full of amazing places to visit from UNESCO World Heritage Sites, National Parks, wine country, storybook villages, and tons of castles. 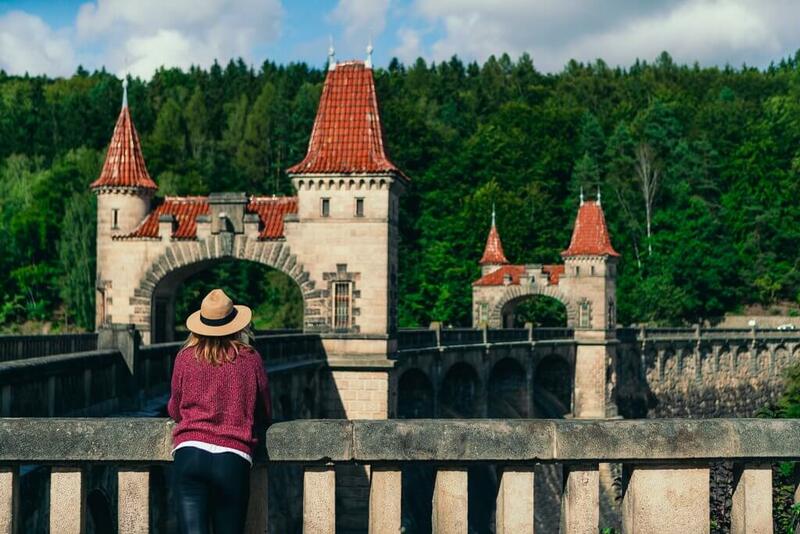 Our site is full of useful tips for traveling in the Czech Republic and tons of destinations to consider for your trip through our months of extensively exploring the country. Travel beyond Prague and experience the magic of this wonderful country. The official currency in the Czech Republic is the Czech koruna (czk international abbreviation). You will need to check exchange rates during your visit but the typical value of the Czech koruna is around $5/4 Euro for 100 CZK. You should check daily exchange rates during your trip for accuracy. The different bank notes include 5000, 2000, 1000, 500, 200, and 100 value notes. Coins include 50, 20, 10, 5, 2, and 1 values. We highly recommend getting your cash in person at local ATMs. We find using an official bank ATM has less fees than exchanging at a money changer. There are also plenty of money changers in Prague that have terrible exchange rates and you will lose a ton of money. Honest Guide has some great content about money changing scams in Prague. NEVER change money on the street with a stranger. This is a common scam where they either exchange counterfeit notes or give you rubels, a currency not used here on unsuspecting tourists. If you don’t want to lose any money you can easily open up a Charles Schwab High Yield Checking account. It’s completely free and they have no ATM fees anywhere in the world! Be sure to set this up a few weeks before your trip so you have your checking card and can transfer money into the account before your Czech Republic travel. Our Czech Republic Travel Guide covers the different transportation options in Prague and the country below. We love using Skyscanner to find flight deals for wherever we travel. You can search for one way, round trip, and multi-city flights as well as hotels and car rentals all in one place. Check out Skyscanner deals here or download the free app to make booking your flights, car rentals, and hotels convenient on the go from your smartphone. The Czech Republic is a part of the EU under the Schengen Zone and most countries do not need a special visa currently visit. However, the European Commission is working on an electronic travel authorization system for visitors that are not a part of the EU. ETIAS travel authorization will be mandatory for citizens of countries beginning in 2021 who currently do not require visas to enter Europe including the United States, Australia, New Zealand, and Canada. You can learn more about the ETIAS visa for the Czech Republic beginning in 2021. Another popular scam in Prague is the taxis. There has been a big problem with taxis overcharging tourists ridiculous amounts of money for rides that locals pay a fraction of the price for. That is why ride share apps have become very popular here and why the taxi drivers hate and protest these services. Uber is a popular option here in Prague and the Czech Republic, however, you won’t be finding too many options available once you’re outside the urban hubs and fewer options even in cities when you’re outside of Prague. A local app you can support is called Liftago. This app hires local Czech Taxi Drivers and is considered the best option as it helps local taxi drivers keep their jobs and alleviate the Uber problem many cities are facing with taxi drivers. Like Uber, Liftago has the driver’s information, your information, ratings for both the driver and rider and you know what you will be paying before you order the ride to avoid overpaying and scams. Travel by train in the Czech Republic is completely reliable and an efficient and cost-effective way to travel the country. This is something that Europe is great for. You don’t necessarily need to rent a car to travel around the country easily. The different companies you can purchase train tickets to and from is Czech Railways, RegioJet, and Leo Express for domestic travel. It is also easy to book international travel through Europe on train too. We like to use Go Euro to look up timetables and book our tickets in advance. They will show you the times, fares, and redirect you to the site to buy your tickets beforehand, it’s surprisingly very easy. If you want to buy tickets on the spot you can show up to the train station and speak to a teller in person who will also help you purchase your tickets. Once you have your ticket, the best way to find your platform is to ask a staff member at the information booth if you don’t see your train number, time, destination on display at the station. Sometimes there are lines, so try to get in line 15 minutes before your departure to make sure you have enough time to wait in line and get to your platform if you are lost. Besides trains, buses are also a great way to travel around the Czech Republic. The best local bus company offering domestic travel is RegioJet. The buses we rode with them were really nice and each seat had its own TV with movies in English as well as an attendant who serves free drinks during your ride. This is more comfortable than air travel in our opinion. Another affordable company who offers great bus routes domestically and internationally is Flixbus. You will want to book your tickets in advance to secure your seat. You can do this again on Go Euro, RegioJet, or Flixbus’s websites. We prefer booking on Go Euro so you can see all the options available and compare easily on one screen and book right there. 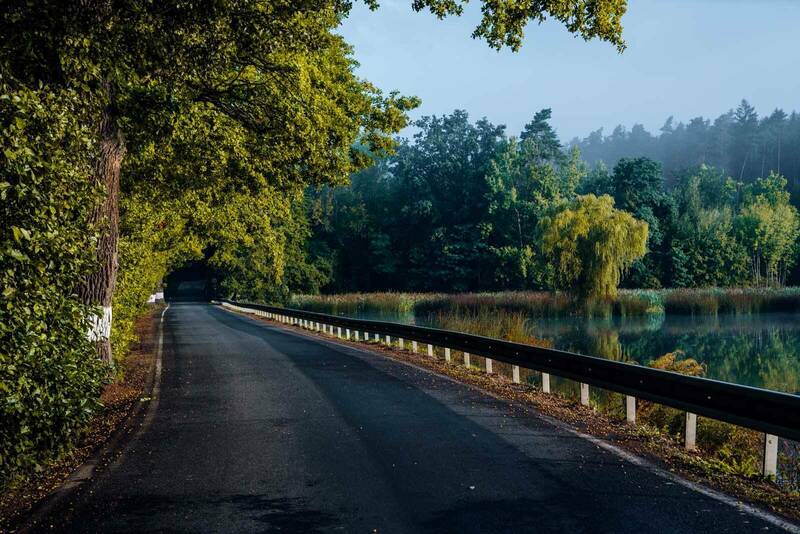 We recommend renting a car in the Czech Republic if you plan on doing some travel outside of Prague for multiple days, which we highly recommend. This is a great way to see the country and make stops where you like when you like along the way. On both road trips we have made tons of unplanned stops at castles and towns that we were driving through that just were too beautiful not to check out. We recommend booking your car in advance on Expedia. You do not need an international driver’s license to rent a car in the Czech Republic, your driver’s license from your home country will work and a passport. Read up on the different traffic signs and meaning in the Czech Republic to avoid any issues. Also, be aware of the speeds limits in the Czech Republic to avoid a ticket! It’s easy to mess up and the ticket will follow you, we received one after our first visit. Also, be aware that Google Maps is sometimes wrong. We were driving through the South Moravian town of Mikulov, where they are especially strict with driving violations, and Google Maps had us going down a small side street that was one way. We missed the sign saying do not enter and got a ticket on the spot. While Google Maps is mostly reliable, it’s not 100% perfect, so know your traffic signs to avoid this. The Czech Republic has a 0 tolerance for alcohol consumption while driving. If you plan on driving and really want to enjoy a beer then there are commonly nonalcoholic beer options at every restaurant. The most popular non-alcoholic beer brand is known as Birell. If you’re not visiting in the winter you may want to opt to travel the Czech Republic by bicycle. Locals are avid bikers and this is a great country to explore by bike if you’re an adventure lover because the country is pretty flat and has well-connected bike trails. This is something we haven’t done yet but would love to. You can find more information here. Whether you’re staying in Prague or anywhere else in the Czech Republic there are tons of great options for accommodation. We highly urge you to reconsider before booking an Airbnb in Prague. Even though we are guilty of staying in an Airbnb in the city, Prague is dealing with a big problem because of the non-regulated service. The biggest problem in our opinion, is that because of the overwhelming amount of listings building owners are placing all of their property on Airbnb to make more money off of tourists and the locals can’t afford to live in the city anymore. You can read more about the Airbnb problem here. We highly urge you to try to book with hotels in the city. We recommend booking well in advance if you’re planning a visit between the peak season of May – September. Check out our guide for where to stay in Prague OR look for hotels on Expedia here. If you’re traveling in the countryside we also recommend checking out pensions. Many of these are available on booking sites. Pensions have more of a cozy, rustic feel to them and often have restaurants on site. If you’re only staying in Prague during your Czech Republic trip then you can easily go your entire trip without eating local Czech Cuisine as there are plenty of international food options in the capital city. We don’t think you should miss out on trying some of the most popular local dishes in the country and of course beer! Did you know the Czech Republic is home to the number one beer consumers in the world? That’s right! Beer is often cheaper than water and is incredibly delicious here. The Czech Republic is also home to the original Budweiser beer, which is nothing like the US beer as they sort of borrowed the name. There’s actually a huge trademark battle that’s been going on for decades, you can read more about the battle of the two Budweisers here. Almost every city has their own beer or microbreweries to check out. The Prague brewed beer is Staropramen, while this is our least favorite of the Czech beers you can easily find most of the other beers from the different regions in the city. Now that we covered beer, we can talk about food! When you eat out in the Czech Republic eating local and traditional dishes, you will notice that the portion sizes are generous and the meals are a bit heavy but oh so delicious. Dishes here are hearty and filling and have been influenced by surrounding Central European countries. The most common meals include soup and meat dishes served with dumplings. We recommend trying goulash, beef tartare, schnitzel, any dishes with mushrooms during the mushroom season! 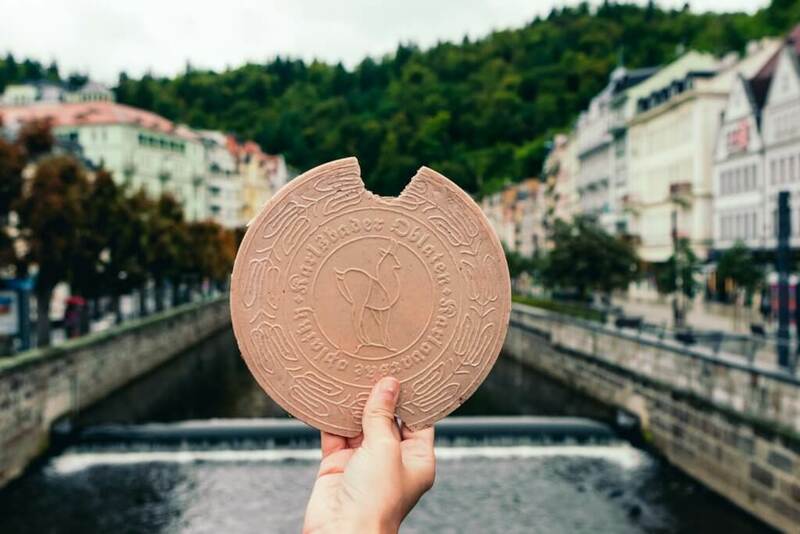 You can find out more information on traditional Czech food to try in this post by The Taste of Prague. The Czech Republic is full of so many wonderful places to visit. We have categorized some highlights of the country and suggested places to visit based on the regions listed below. 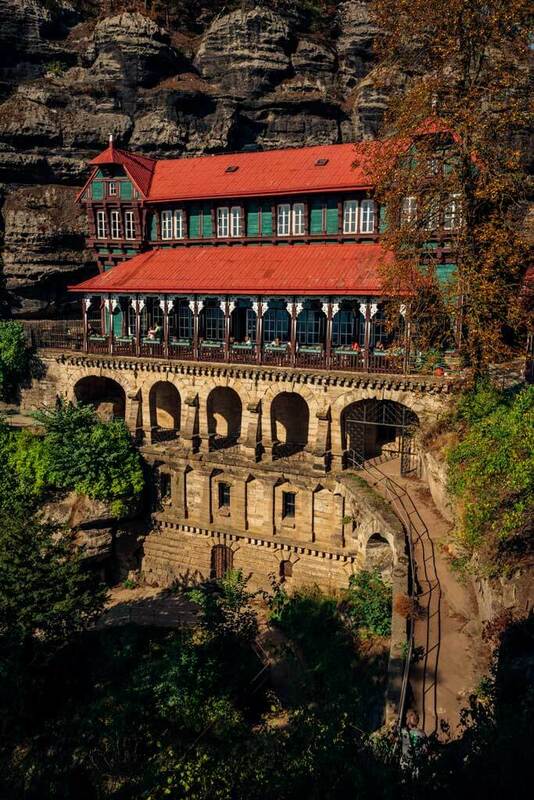 Bohemian Switzerland National Park: Hike through one of the four Czech National Parks through gorgeous gorges, to sweeping vistas, rock formations, and experience Europe’s largest sandstone arch. Read more here. Bohemian Paradise: Enjoy the great outdoors in Bohemian Paradise Geo Park’s outdoor activities including kayaking, hiking, and unique rock formations. There are also great castles and ruins in this vast landscape. Read more here. Terezin: Once a holiday resort turned into a concentration camp used in WWII 30 miles north of Prague. Krkonoše Mountains: Home to the highest mountain in the country with waterfalls and great hiking trails. Ještěd: An unusual looking television transmitter and hotel located on the top of a mountain also offering skiing in the winter. 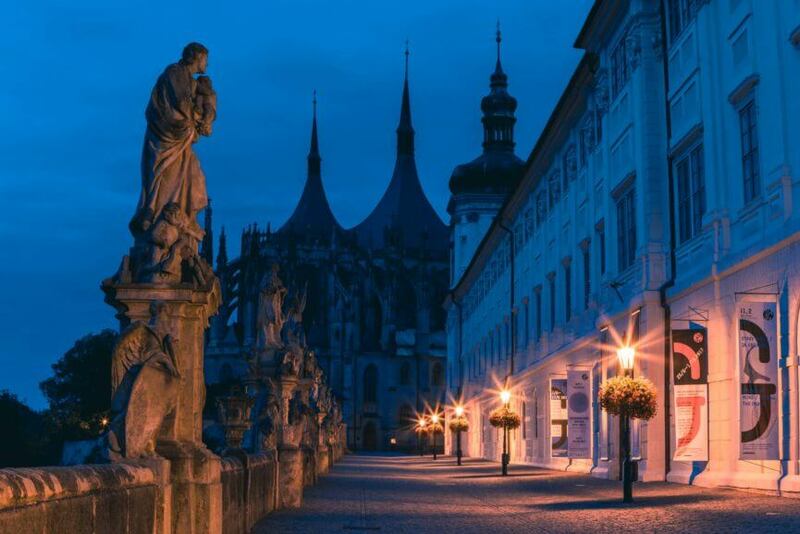 Kutna Hora: This silver mining city is full of gorgeous architecture from their wealth such as the Santa Barbara Cathedral and nearby Sedlec offers the famous bone cathedral and UNESCO sites. Read more here. Karlštejn Castle: A gorgeous gothic castle sitting on a hill overlooking the beautiful town below popular with day visitors from Prague due to its close proximity. Konopiště Castle: Gothic castle once the home to Archduke Franz Ferdinand. Brdy Mountains: A former military base now an outdoor enthusiasts hangout with hiking and bike paths in the beautiful surrounding forest with two mountains. There are still landmines here, so be sure to not stray off the paths here. 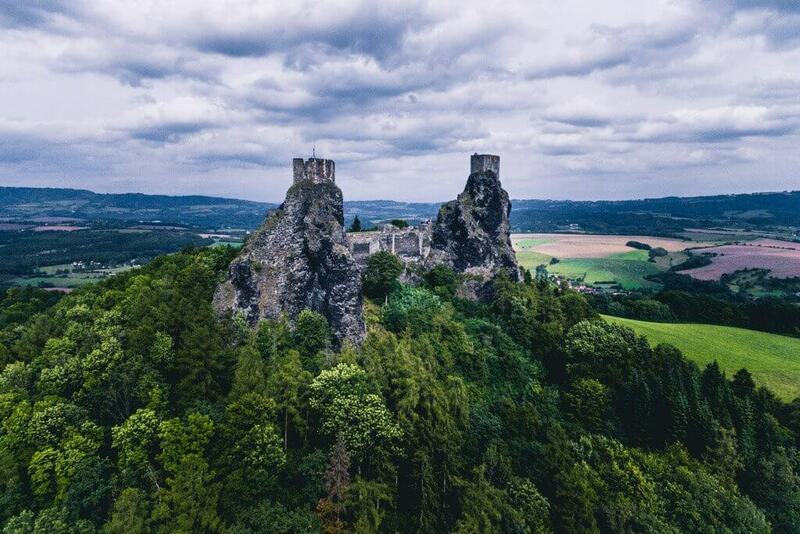 Read more about day trips from Prague in Central Bohemia here. České Budějovice: Beautiful city home to the original Budweiser beer and the gorgeous white neo-gothic castle Hluboka. Read more here. 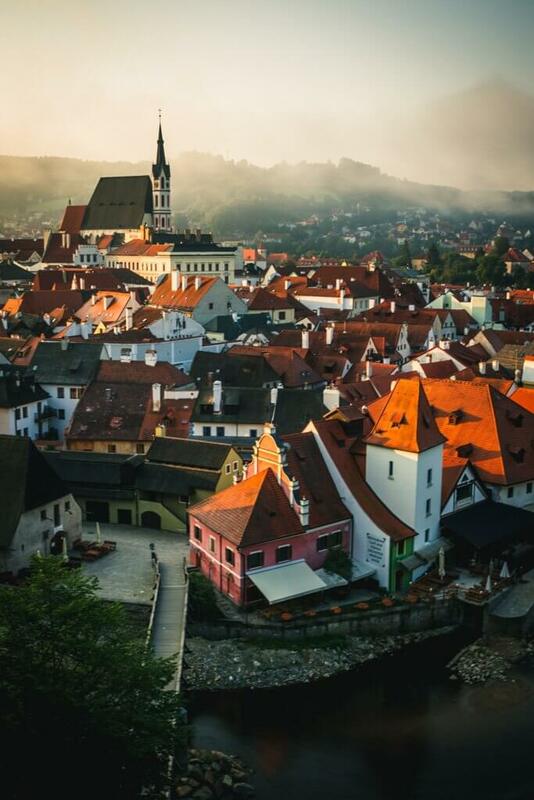 Český Krumlov: UNESCO World Heritage Site town straight out of the pages of a storybook with an impressive castle. Read more here. 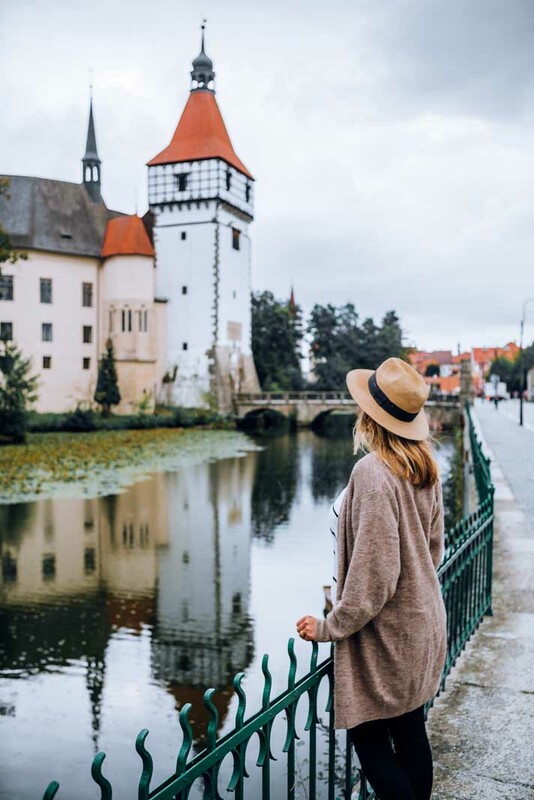 Třeboň: A gorgeous town with an intricate and interesting canal system, colorful town square, castle, tomb, and the local specialty is carp. Read more here. Tábor: Read more here.A fun stop and pretty small town with an attractive town square and castle. Read more here. Blatná: A quaint town with a beautiful castle and gardens with free-roaming friendly peacock and deer. Read more here. 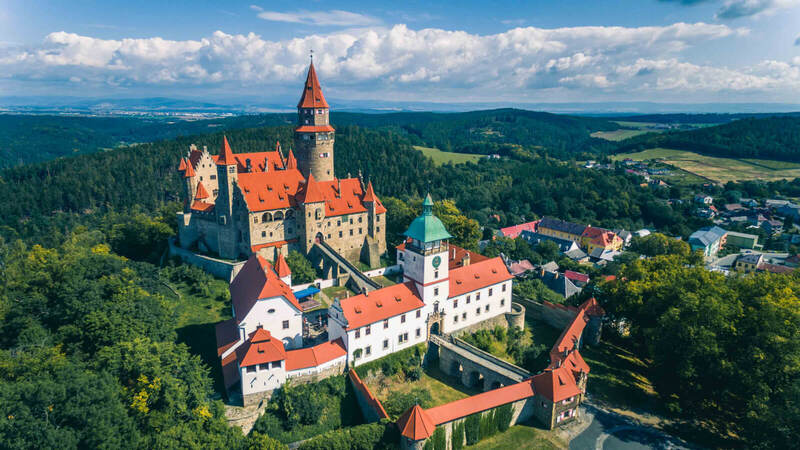 Zvíkov: Home to a gorgeous castle known as the “king of Czech castles,” and nearby Orlik Castle and boat ride back and forth between the two situated on the Vltava River. Read more here. Litomyšl Castle: One of the largest Renaissance castles in the country as well as a UNESCO World Heritage Site. Read more here. Kuks: Small city with a famous Baroque spa building and statues. 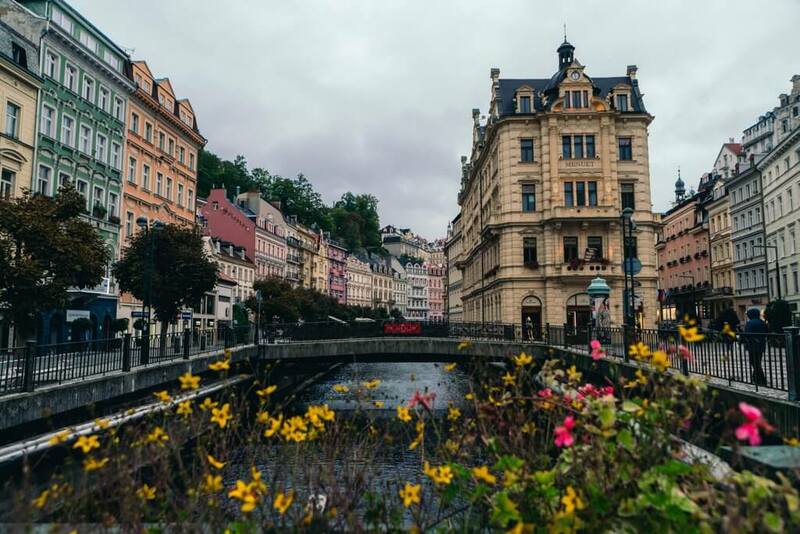 Karlovy Vary: A gorgeous spa town with thermal springs attracting visitors for its healing properties. Read more here. Loket: A beautiful, small medieval town with an impressive castle and filming location for 007 scene with Daniel Craig. Pilsen: City home to the pilsner style beer and the Pilsner Urquell Brewery. Ostrava: Capital of the region and on the border with Poland and the 3rd largest city in the country. 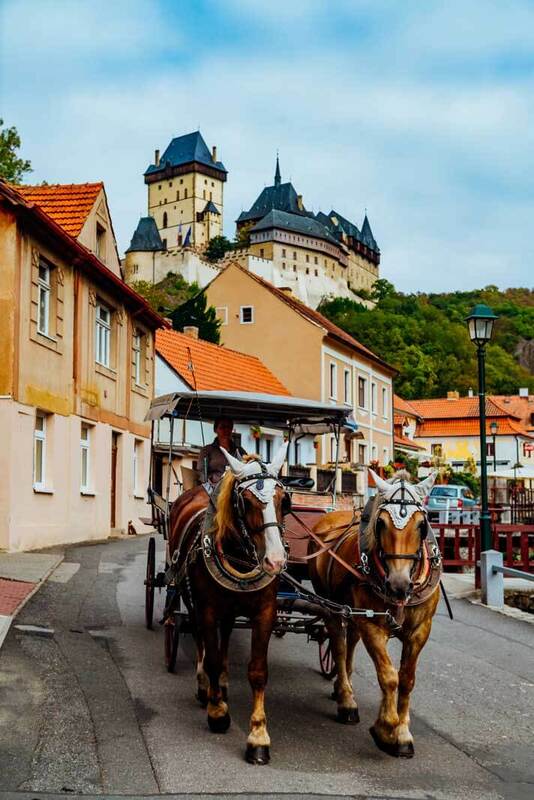 Štramberk: A small town with a beautiful castle and known as the Moravian Bethlehem. Olomouc: A gorgeous city once briefly home to Mozart with their very own cheese and known as Little Prague with one of the most beautiful and ornate running hospitals in the world. Read more here. Bouzov Castle: 14th-century castle set in the Moravian countryside that looks straight out of a fairytale. Zlin: City on the Dřevnice River on the SouthEast border or Moravia. 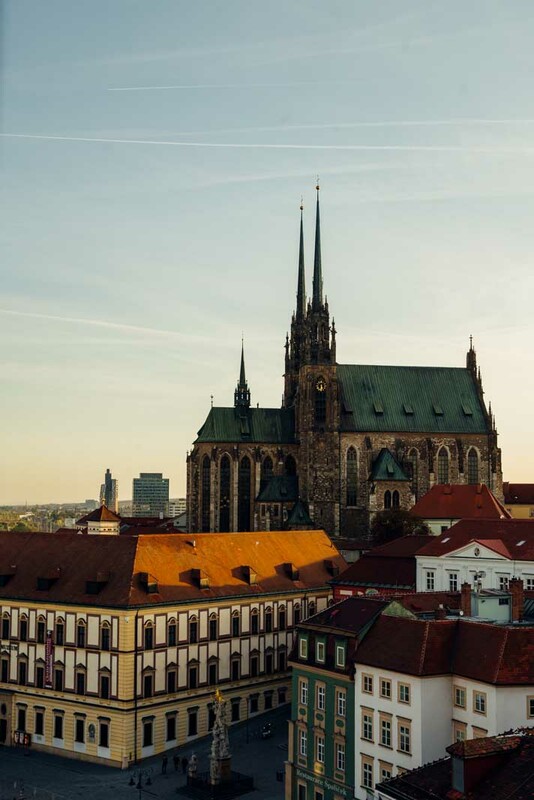 Brno: The country’s second largest city with a great foodie scene, gorgeous cathedrals, museums, and underground to visit. Read more here. Moravian Karst: Cave system with a beautiful gorge just north of Brno near the town of Blansko. Mikulov: Romantic town with an enchanting castle in the heart of the Moravian wine region. Read more here. 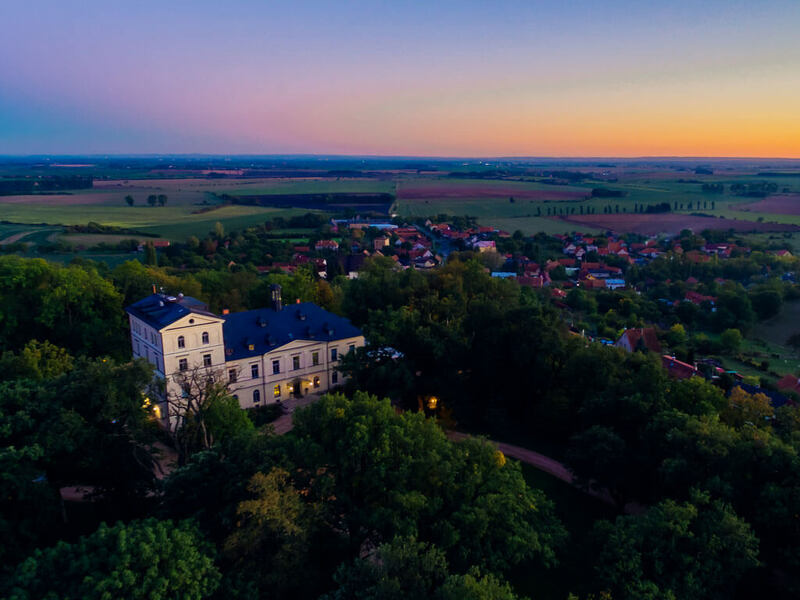 Lednice/Valtice: The cultural landscape is a UNESCO World Heritage Site and in the heart of the Moravian wine region just a short drive from Mikulov. Each Lednice and Valtice have a gorgeous chateau beautifully preserved inside and out with gardens and wine tasting cellars. Read more here. Znojmo: A beautiful walled town with an impressive castle in the wine region of South Moravia. Traveling to the Czech Republic for 3, 5, or even 8 days? Check out our detailed Czech Republic itinerary here to help you plan your trip. Disclaimer: This post contains affiliate links, by purchasing through some of the links on our site we receive a small commission at no extra cost to you! Found this Czech Republic travel guide helpful? Bookmark for later or share on Pinterest below.